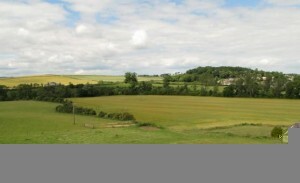 The plot we bought from Pete and Geraldine O’Driscoll is about 3 miles east of Kelso along the main road to Coldstream. Well, we say main road. To us it seems impossibly quiet with what feels like 5 cars a day passing by. In reality it’s probably a busy 30 cars a minute at peak levels but since its going to be 200 yards away on the other side of the farm, we shouldn’t be too bothered by it. 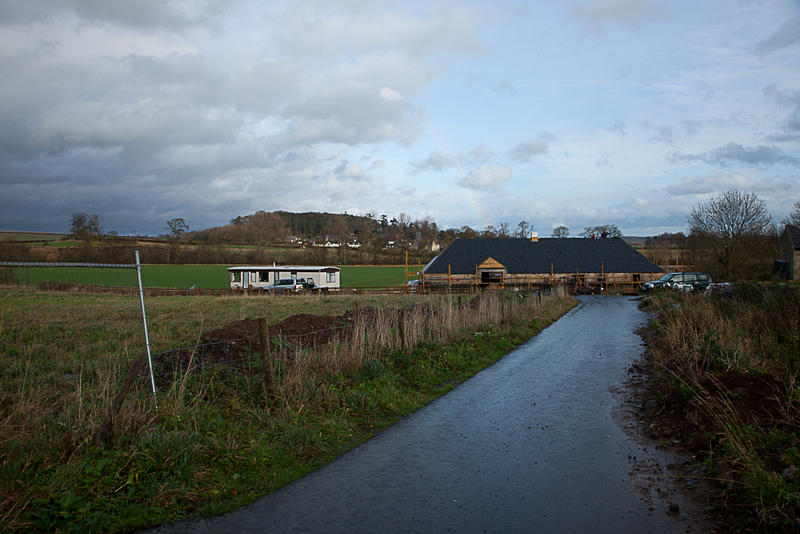 Edenmouth Farm is situated just above the confluence of the Edenwater and the Tweed. Our house will sit about 9 metres above the usual level of the Tweed, and as far as we can tell, it has rarely, if ever, flooded that high before. Even in the very high floods of 1948 that destroyed bridges throughout the Borders the farm was left untouched. The location feels pretty much ideal for us – within striking distance of a reasonable sized town (Kelso) with a back road walking route to the shops but still in a largely rural location. The A1 and the main line railway at Berwick is about 30 minutes away by car, and we can be in central Edinburgh inside an hour’s drive. A barrow set above the bank of the River Tweed at Edenmouth was removed in 1843 and found to cover a stone lined coffin containing a skeleton and a pottery vessel known as a Beaker of Early Bronze Age date. Maps published from the late nineteenth century onwards indicate that the layout of Edenmouth farm has changed considerably over the last century.The first edition Ordnance Survey 6-inch map of Roxburghshire (1863) shows a scattered arrangement of buildings, stretching north and west of the farmhouse. Subsequent maps show that most of the buildings are now centred around a courtyard, with the farmhouse now standing in a large garden, an arrangement typical of late nineteenth- and twentieth-century farms. Some older buildings do survive, including the farmhouse, part of the steading, and workers’ cottages. These buildings are constructed of stone, and roofed in slate, features typical of this area. A dovecot is built into the roof in the central part of the steading. This farmstead, which appears to have undergone considerable alteration, is of U-shaped plan and has a building of L-shaped plan within the courtyard. 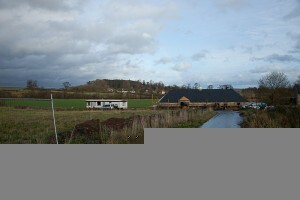 A separate barn range exploits the water power of Eden Water. The “barn range”, an old corn store housed a water mill, the remnants of which are still visible in the newly renovated building.